Over the years I’ve noticed the acronym ‘SMIB’ (“so mote it be”) is, more often than not, used in ways that just seem unusual. While it’s been part of Masonry since forever – appearing in one of the earliest works, the Regius Poem – it seems that Freemasons don’t always know how to use the phrase. 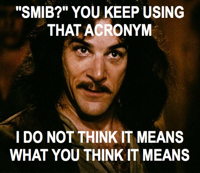 Now I’m not a grammar nazi or a member of the Masonic Sentence Police, but it seems to me that proper use of ‘SMIB’ is when you’re closing a written conversation, and using it in reverence – as if you’re ending a prayer. But, y’know … that’s just me.